The world's current number 1 ranked player, Rafael Nadal (pictured above) was made to dominate on clay. Expect a championship in Madrid tomorrow as he preps for another run at the French Open Title. Earlier today, in a semifinal matchup in Madrid, Rafael Nadal defeated long time nemesis Roger Federer yet again. Rafa, as many call current the number 1 ranked player in the world, has now won 37 consecutive clay court matches. And Nadal also sports an 11 and 2 record against the one who many have declared “the greatest player of all time” on his native clay court surface. So let me get this straight. Nadal has an 11-2 record vs Federer on clay? How many guys have a winning record against the all time Grand Slam King? How many guys can even say they have defeated the guy one time? Not too many. Rafa can say that he has owned and humbled the former world number 1 on clay for the better part of a decade. One somber note about today’s match and a sign of the change in times. This was a semifinal matchup. Federer is the 3rd ranked player in the world these days. Roger has been leapfrogged by the upstart Serbian, Novak Djokovic, who has won an astounding 31 consecutive matches to start 2011. This is the 3rd longest winning streak of all time. Well I will be blunt. Djokovic’s streak ends tomorrow. No way he will beat the man who I am going to call the “God of Clay” in Madrid. So what if Djokovic has defeated Rafa in 3 tournament finals already in 2011. It is a clay court season. AKA, the Rafa season. Nadal has won 5 French Open titles in his already illustrious career. And appears to only be getting better on the clay. 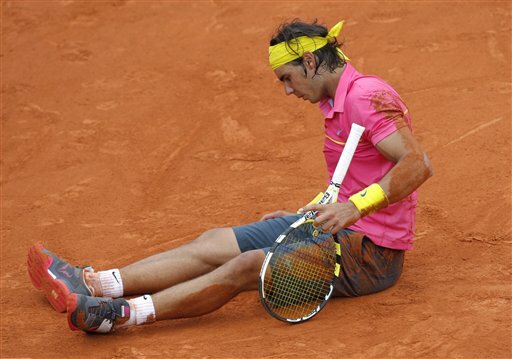 When Roland Garros decided to utilize the orange clay, they had Rafael Nadal in mind. Nadal’s style of play fits perfectly for the clay court surface. Rafael’s game can be described by 3 simple terms. If you want the perfect clay court player, combine those 3 attributes at the highest level. You will get a man by the name of Rafael Nadal. The game has changed. Guys like Djokovic and Murray have caught Federer. But when it comes to clay. Nobody will catch the “God” that is Nadal any time soon. Expect Nadal to defend his title in Madrid as he preps for a 6th French Open Title. This entry was posted in Tennis and tagged Andy Murray, French Open, Grand Slam, Madrid, Men's Tennis, Novak Djokovic, Rafael Nadal, Roger Federer, Roland Garros. Bookmark the permalink.